Operation Frequent Wind was the emergency evacuation by helicopter from Saigon, South Vietnam, in April 1975 during the last days of the Vietnam War. The operation was based on Operation Eagle Pull, the American evacuation by air of Phnom Penh, Cambodia, on April 12, 1975. Operation Eagle Pull had been a huge success in terms of meeting all goals set out by military planners. "Frequent Wind" was the second code name chosen when the original code name "Talon Vise" was compromised. A code that was to be used to signal the start of Frequent Wind was distributed to the press and American civilians in the city. The code was a quotation on Armed Forces Radio: the comment that the temperature is rising, followed by eight bars of White Christmas. (Japanese journalists were concerned that they would not recognize the tune and had to get someone to sing it to them). In the run up to the evacuation, thousands of Vietnamese wanted to escape the encroaching communist forces. With so many desperate people and so many civilians in knowledge of security codes, security was broken almost as soon as the code song was given out. When the operation started thousands of Vietnamese tried to flood what was thought to be the US embassy in Saigon. One of the landing zones was frequently referred to as the US Embassy, but in fact is an apartment building several blocks away (this building was Pittman Apartments which was used as residential quarters for various US diplomatic personnel) that was one of several pick-up points for the American evacuation. Protecting the evacuation force on the ground in South Vietnam were combat elements of the 9th Marine Amphibious Brigade, including the 2nd Battalion, 4th Marines and 2nd Battalion 9th Marines (which would two weeks later be engaged in the rescue of the SS Mayaguez). The last contingent of Americans that left Vietnam were U.S. Marine Security Guards who departed at 7:58 am from the rooftop of the U.S. Embassy. 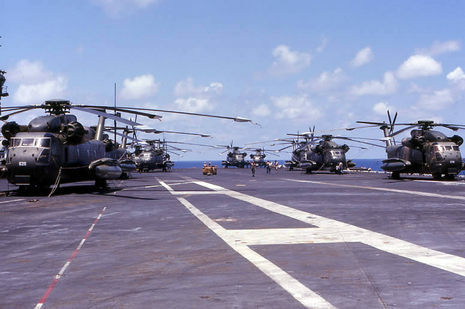 1,373 U.S. citizens and 5,595 Vietnamese and third country nationals were evacuated by military and Air America helicopters to U.S. Navy ships off-shore in an approximately 24-hour period on April 29 to 30, 1975, immediately preceding the fall of Saigon. 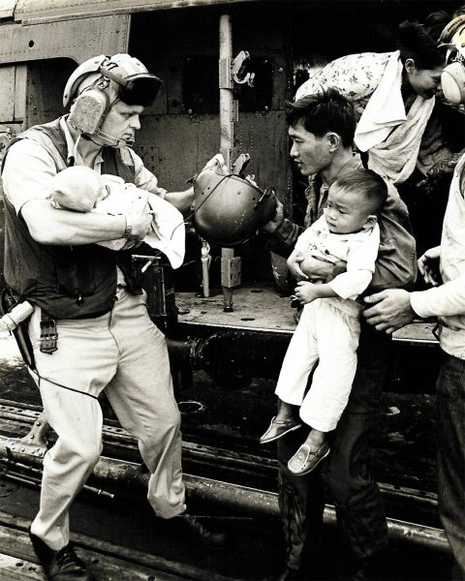 During the operation, so many South Vietnamese helicopters landed on the vessels taking the evacuees that some were pushed overboard to make room for more people. Other helicopters, having nowhere to land, were deliberately crash landed into the sea, close to the ships, their pilots bailing out at the last moment to be picked up by rescue boats. Many of the Vietnamese evacuees were allowed to enter the United States under the Indochina Migration and Refugee Assistance Act. Operation Frequent Wind, the evacuation of Vietnam in April 1975, moved over 50,000 people. The initial decision to depart Saigon was made to evacuate the Defense Attaché's office by fixed-wing aircraft. This fixed-wing evacuation was determined impossible when hostile artillery and rocket fire closed the air base at Tan Son Nhut. 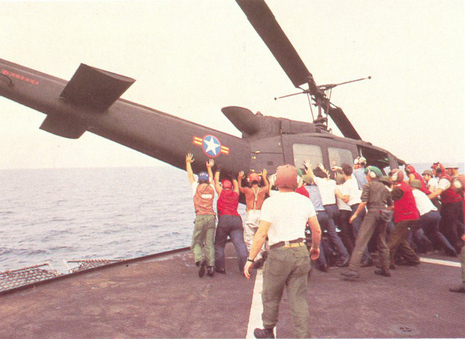 The decision to evacuate the entire US presence by helicopter under Operation Frequent Wind was made late morning, 29 April 1975, Saigon time. Due to the delayed timing of the order, the capability for rapid response to such an order was imperative. The deteriorating situation at the Defense Attaché location required the Embassy to become a major site.